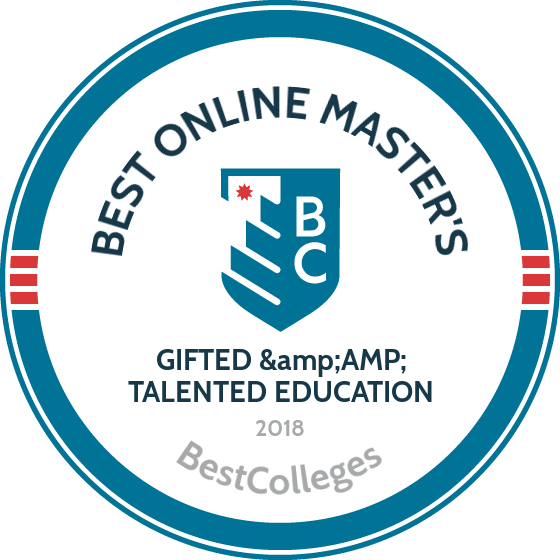 What Are the Best Online Master's in Gifted and Talented Education Programs? What Else Can I Expect from an Online Master's in Gifted and Talented Education Program? Want to help gifted and talented students reach their full potential, but don't have time for a campus-based advanced degree? An online master's in gifted and talented education prepares you to work effectively with advanced students in teaching, administration, or instructional design roles, and offers a path toward a significant salary boost. According to the National Center for Education Statistics, the average base salary for teachers in public schools with a master's degree exceeds that of teachers with a bachelor's degree by approximately 20%. A master's program offers an opportunity to become well-versed in theory, research, and strategies of gifted education. Master's programs in gifted and talented education are designed for students who already hold a bachelor's degree and a current state-issued teaching credential, and most also require a minimum of one to two years of teaching experience. The teaching license can be in any area, whether it be elementary, secondary, or special education. Students who complete an online degree in gifted and talented education programs and have sufficient work experience can apply for endorsements to teach advanced learners. CAN I WORK WHILE I COMPLETE MY ONLINE MASTER'S IN GIFTED AND TALENTED EDUCATION? It's common for students in gifted and talented education to work in the field while completing their degree. In order to complete the requirements for classroom-based practica, internships, clinical experiences, and other teaching competency requirements, candidates for online master's in gifted and talented education programs need access to an appropriate educational setting. WHAT ARE THE ADVANTAGES TO EARNING MY GIFTED AND TALENTED EDUCATION DEGREE ONLINE? Online programs are designed for maximum convenience and flexibility, and have improved in quality in recent years. More options are available for students to select a program that suits their needs and career goals. Many students appreciate the perspective they gain through online programs as they network with peers working in classrooms across the country, and lessons from your online program can be incorporated into classroom teaching experiences while you pursue this degree. Home to about 50,000 students from 130 countries, the University of South Florida is renowned for its academically rigorous curriculum, interdisciplinary research, and distinguished faculty. USF, which has more than 180 undergraduate majors and concentrations and numerous graduate programs, offers e-learning opportunities via USF Online. USF's online master of arts in gifted education is a 36-credit hour program designed to teach certified teachers how best to serve gifted learners. Students learn to address cognitive and affective needs and how best to develop appropriate educational opportunities. The curriculum for this master's in gifted education online program includes a focus on classroom assessment and students with exceptional talents, in addition to practicum supervised by faculty. It also includes 15-hours (five courses) of coursework needed for the Florida Endorsement in Gifted Education. As part of the program, students are required to maintain an e-portfolio. Note that out-of-state students may be eligible to receive in-state tuition. The University of Georgia offers an online M.Ed in educational psychology with a concentration in gifted and creative education. The program requires 37 semester hours and prepares students to develop inclusive programs for diverse classrooms. The curriculum teaches methods for fostering creativity and conducting research. The program culminates in a practicum and a comprehensive final exam. Students earning the master's in gifted education online complete Georgia's requirements for the Gifted In-Field Endorsement. Applicants must have a bachelor's degree, preferably in a related field, and a minimum 2.6 GPA. UGA accepts up to six transfer credits. All online students pay the same tuition rate, regardless of residency, and have access to a virtual library, career services, and academic support services. UA offers distance education programs to students around the world. The university's MA in special education with a gifted and talented certification requires 30 credit hours. UA offers the special education MA in a blended format, which features asynchronous and synchronous online classes, plus weekend classes at one of UA's campus locations. The program accommodates teachers' schedules, so students can work full time while completing the online gifted education program. Students can request to complete the required practicum locally. Applicants must have earned a bachelor's degree with a minimum 3.0 GPA and must hold a valid Alabama Class B teaching certificate or its equivalent. Online students have access to an online writing center, tutoring services, and online library resources, including workshops and research guides. Based on a 7,000-acre campus in Lynchburg, Virginia, Liberty has provided distance education programs since 1985. The university offers the M.Ed in teaching and learning with a concentration in gifted education in an asynchronous format. The 36-hour master's in gifted and talented education program prepares students to teach K–12 in any school setting, including Christian, private, and public schools. During concentration coursework, students learn to design and implement programs for gifted children. Students also complete core teaching and learning courses, plus professional courses in leadership training. The program culminates in a practicum. Liberty accepts up to 18 transfer hours. Online students have access to resources including wellness groups, an online writing center, and online student groups. Founded in the early 1900s as a teacher preparation school, UNK offers an online MA in special education with an emphasis in gifted education. The program requires 36 credit hours and meets the requirements for the Supplementary Endorsement in Gifted Education in Nebraska. Students learn to design and implement effective gifted education programs. Applicants to the online gifted education program must have a bachelor's degree and valid teacher certification. Prerequisites include an introduction to exceptionalities, which UNK offers as an additional three-credit class. Students in the gifted education emphasis choose between thesis and non-thesis options, both of which require a practicum and comprehensive exams. Having grown from an agricultural school to a modern academic powerhouse, today's Arkansas State University awards undergraduate and graduate degree programs through 11 colleges. Approximately 14,000 students attend ASU and enjoy access to online programs in areas such as business administration, education leadership, media management, and sports management. ASU's 30-credit master of science in education--gifted, talented, and creative program provides students with teacher training, research best practices, and the development of successful learning models for gifted learners. Areas of study include affective programming in the classroom, assessment of programming for GTC, philosophies of education, and introduction to statistics and research. This online master's in gifted education is an application-based curriculum that can be completed in just 18 months. Note that a seven-week practicum and seven-week internship are required with site approval from the program's director. Out-of-state students need to check licensure requirements for their states to determine program applicability. Founded in 1867 in in Morgantown, West Virginia, WVU offers an MA with a major in gifted education that prepares working teachers to accommodate gifted students. The curriculum covers topics related to special needs programs, behavior management, and fostering gifted education. The program offers a track that leads to gifted education certification. The certification and non-certification track each require 36 credits, including a practicum. WVU offers flexible scheduling; full-time students who take nine credits per semester complete the online master's in gifted education in as few as 18 months, while part-time students who take at least two courses per year graduate within eight years. Applicants must have earned a bachelor's degree with a minimum 3.0 GPA, and WVU students must maintain at least a 3.0 GPA. The university pairs each online student with an enrollment coach and an academic advisor. Based in Denton, UNT offers an MS in educational psychology with a concentration in gifted and talented that prepares students to plan programs and curricula for gifted students. Students in the 33-hour, customizable program choose between three-week, five-week, and eight-week courses. Full-time students can complete the degree in as few as 15 months. Unlike other gifted and talented master's degree programs, online students in UNT's program complete a supervised research capstone project. The university delivers all coursework asynchronously and requires no campus visits. The program meets Texas Examination of Educator Standards, so graduates are eligible to take the Gifted and Talented Supplemental Certificate exam. Students who already hold teaching certification earn the Graduate Academic Certificate in Gifted Education. Among more than 100 online degrees and certificates, Mizzou offers an M.Ed in special education with an emphasis in gifted education. The program covers advanced program planning methods and research and learning strategies for gifted students. The 30-hour degree meets the requirements for Missouri gifted education certification from the Missouri Department of Elementary and Secondary Education. Students earning the master's in gifted education online complete coursework asynchronously. Most students graduate in two to three years. Applicants must have earned a bachelor's degree with a minimum 3.0 GPA. Transfer students may bring up to 20% of the required credit hours. Online resources include tutoring, a writing center, and career and counseling services. The University of North Carolina at Charlotte, an urban research university, is known as a hub of exemplary scholarship at both the undergraduate and graduate levels. The school's online programming includes graduate degree programs in education, nursing, respiratory care, and engineering. UNC Charlotte's 33-credit online MEd in special education: academically or intellectually gifted program is designed for experienced K-12 teachers with a minimum teaching license at the level of Standard Professional 1 (SP1). Areas of study includes instructional methodology for gifted students, qualitative research methods, adapting classroom materials and classroom differentiation, and AIG research implementation. There are no electives in this program, but students must gain field experience with AIG students in the classroom. A research project serves as the program's capstone. Upon completion of this 100% online master's in gifted and talented education, graduates qualify for the state's SP2 teaching license in special education. UNC has provided teacher education programs since the late 1800s. The university's MA in special education with an emphasis in gifted and talented education provides skills necessary to identify and assess gifted students and to design effective educational programs and services. Students complete a practicum during which they apply classroom knowledge. The online gifted education program requires 36 credit hours. Applicants must have a bachelor's degree, a minimum 3.0 GPA, a valid teaching license, and at least two years of professional experience. Applicants without a teaching licence must complete the professional teacher education program before enrolling. UNC evaluates transfer credits on a case-by-case basis. Online students have access to the writing center, advanced research assistance, and a tutoring center. Based in Hattiesburg, Southern Miss offers an M.Ed in special education with an emphasis in gifted education exclusively online. The program requires 33 to 36 credits and teaches students to assess and accommodate exceptional learners. Students customize the master's in gifted and talented education through research classes, electives, and practicums. Graduates with valid teaching licensure meet the requirements for gifted education certification from the Mississippi Department of Education. Southern Miss also provides pathways for students without teaching licensure. The university delivers classes primarily asynchronously, but some instructors schedule live lectures. All online students pay the same tuition rate, regardless of residency. Online resources include a writing center, library support, and student success services. Part of the Texas State University System, LU offers an online M.Ed in teacher leadership with a specialization in gifted and talented. Students learn to identify, assess, and nurture gifted students. Graduates create inclusive learning environments for exceptional students. The 36-hour online gifted education program prepares students to pursue certification after graduation. Students can complete the degree in as few as 18 months. Participation in a specialization area may or may not lead to additional credentialing. It is the responsibility of the student to confirm the requirements for certification and/or endorsement in a specialization area. Applicants must have a bachelor's degree, a minimum 2.5 GPA, a teaching certificate, and at least two years of teaching experience. LU's online classes run in five-week terms, and the university offers multiple start dates throughout the year. In addition to on-campus programs at locations throughout Delaware and New Jersey, WilmU offers more than 90 degrees, certificates, and concentrations entirely online. The M.Ed in instruction with a gifted and talented concentration requires 33 credits and prepares learners to create and teach programs for exceptional students. The curriculum includes 15 credits in the gifted and talented concentration and leads to gifted and talented certification from the Delaware Department of Education. Applicants must have a bachelor's degree, a minimum 3.0 GPA, and a teaching certificate. Students in the online master's in gifted education program must be employed as teachers in order to complete various assignments and the final practicum. Students complete a final portfolio presentation that must meet the National Gifted Education Standard. Online students who live near any of WilmU's campus locations can pursue the degree in a hybrid format. Most students complete the program within two years, but WilmU allows students five years to graduate. FHSU was founded in Kansas in 1902 as a teacher's college. The university offers an MS in special education with an emphasis in gifted education designed to prepare learners to educate gifted students. The 36-hour curriculum focuses on action research, and students gain practical experience to prepare them for teaching roles. The program is accredited by the Kansas State Department of Education, and graduates receive an endorsement in gifted education. Applicants must have a bachelor's degree, a minimum 2.5 GPA, and a valid teaching license. FHSU's degree offers more flexibility than many gifted and talented master's degree programs; online students who accelerate the program can graduate in as few as 18 months. Founded in 1884, NSU's Natchitoches campus is the oldest site for higher education in Louisiana, and the university created the state's first and largest electronic campus. NSU's M.Ed in special education with a concentration in gifted education prepares learners to build educational programs that meet the needs of gifted students and to foster their creativity and exceptionalities. Students earning the master's in gifted education online complete 36 semester hours. NSU delivers most courses asynchronously, but some instructors incorporate scheduled lectures. Students can fast-track the degree by taking two courses per eight-week term. NSU's summer session offers courses in four-week and eight-week formats. Applicants must have a bachelor's degree and teaching certification. In most cases, distance learners can take tests and final exams at a local testing center, but some instructors require students to take exams on campus. Online students have access to academic support and career and counseling services. ENMU offers more than 30 entirely online degrees, including an M.Ed in special education pedagogy with a gifted emphasis. The 36-credit degree provides licensed teachers with a gifted endorsement and training necessary to develop programs for exceptional students. The curriculum includes a theory practice course, which requires learners to hold a grade school teaching position. The online gifted education master’s degree features courses in special education law and high incidence disabilities, and the program meets New Mexico Public Education Department licensure requirements. Online students have access to tutoring services and the writing center. The online library and student success center provide access to research guides and databases. Founded in Spartanburg, South Carolina, as a women's college in 1890, Converse College has a history of developing future educators; the first graduate-level program Converse offered was in teaching. The college's M.Ed in gifted education requires 36 hours and prepares students to design programs for gifted learners. Students develop a portfolio that meets the National Board for Professional Teaching Standards. The master's degree in gifted education culminates in a practicum completed in a school setting; students in the Spartanburg area can complete the practicum on campus during a two-week summer session. The master's in gifted and talented education program meets South Carolina's gifted educator certification requirements. Applicants must have a bachelor's degree, a minimum 2.75 GPA, and teaching certification. Online student support includes academic advising and tutoring. Based on a 330-acre campus in Kansas, WSU offers programs at satellite locations and online. The online M.Ed in special education with an emphasis in gifted education is designed for students with a valid teaching license. The special education master's degree teaches learners to identify and educate students with intellectual exceptionalities. Learners are prepared to teach students in elementary through secondary school. Students in the online gifted education program complete 30 to 33 credit hours and choose between thesis and non-thesis tracks. Applicants must have a teaching license, a bachelor's degree, and a minimum 3.0 GPA. All online students pay the same tuition rate, regardless of residency, and have access to online tutoring, the writing center, and career and counseling services. WSU offers a generous transfer credit policy that can significantly reduce degree completion time. Students completing Millersville's online programs, including the M.Ed in gifted education, access coursework asynchronously and customize their education through electives and specializations. The 36-credit master's degree in gifted education requires a core curriculum focusing on on child psychology and strategies for instruction and curriculum development. Students can specialize in areas including special education, psychology, and leadership. Students in the online master's in gifted education program can earn a gifted education endorsement and a gifted education certificate. Applicants must have a bachelor's degree, a minimum 2.75 GPA, and Pennsylvania Instructional I certification or its equivalent. Students complete the required practicum at their own workplace. Based in Bowling Green, WKU offers more than 100 online degrees and certificates, including an online MA of education in gifted education and talent development that prepares K–12 teachers to create and implement curricula that address the needs of gifted learners. The master's in gifted and talented education program requires 30 to 37 credit hours and offers two pathways: advanced certification and advanced research. The advanced certification pathway leads to a Rank II certification in Kentucky and an endorsement in gifted education. The advanced research pathway is designed for applicants with a master's degree and may lead to a Rank 1 certification in Kentucky. Applicants to the advanced certification pathway must have a minimum 2.75 GPA and a teaching certificate. Applicants to the advanced research pathway must have a master's degree and a minimum 3.0 GPA. Regent offers an online M.Ed in curriculum and instruction with a concentration in gifted and talented that provides flexible scheduling options for distance learners. The 35-credit program develops learners teaching abilities and prepares them to modify educational programs to meet the requirements of gifted students. The degree offers a gifted and talented endorsement option for Virginia residents and teachers licensed in Virginia and a non-endorsement option for out-of-state students. Regent's program meets Virginia Department of Education standards. Students earning the master's in gifted education online complete a 45-hour practicum at their place of work. Applicants must have a bachelor's degree and a teaching license. Regent enlists online students in a peer mentorship program and provides access to online tutoring, career services, and an extensive online library. Based in Richmond, EKU has been training future educators for more than 100 years. The university's 30-hour online MA in education with a concentration in gifted education provides skills necessary to prepare programs and lessons suited to gifted students. Learners complete the asynchronous program over eight-week terms and take coursework that builds leadership skills. The program culminates in a leadership capstone project. EKU's online gifted education master’s degree is available to students across the country, but residents of some states are not eligible to earn the accompanying Kentucky Teacher Leader Endorsement. Graduates with Kentucky teaching licensure are eligible for an upgrade in teaching rank. Applicants must have a bachelor's degree and a minimum 3.0 GPA. An historic, private university in Springfield, Missouri, Drury University offers an M.Ed with an emphasis in gifted education for licensed teachers. The 36-hour degree features courses in the counseling and guidance of gifted children and the administration and management of classrooms. Students across the country can enroll in the master's in gifted and talented education program, but the gifted education endorsement is designed specifically for Missouri teachers. Graduates with a Missouri teaching license receive upgraded certification. Missouri students can complete practicums at the Drury University Center for Gifted Education. Applicants must have a bachelor's degree, a minimum 2.75 GPA, a teaching license, and at least two years of teaching experience. Applicants who do not have a teaching certificate may fulfill licensure requirements through 45 additional credit hours and a 16-week teaching placement. Founded in 1879 in Kentucky, Union College offers an MA in education with a specialization in gifted education. The 31-hour curriculum comprises 19 hours of core courses and 12 hours of specialization coursework. The core program fulfills the requirements for the Education Professional Standards Board's Teacher as Leader Endorsement. The specialization provides skills necessary to assess gifted students, design effective learning programs, and implement programs within classrooms and communities. Applicants must have a bachelor's degree, a minimum 3.0 GPA, and teaching certification. Only Kentucky residents are eligible for the Teacher and Leader Endorsement. Students can complete the online gifted education program within two years, and transfer students who bring the maximum six previous credit hours may graduate more quickly. All online students pay the same tuition rate, regardless of residency. For most online degree in gifted and talented education programs, core coursework requirements are similar but schools vary in quality, focus, and details. When evaluating potential schools, consider program length, licensing or certification requirements for the state in which you plan to teach, and specifics of the curriculum. Acceleration Accelerated students are advanced to a level that is a closer match to their abilities. It may take the form of "grade-skipping," partial acceleration through specific fields of study, or early college entrance programs. A popular and low-cost approach, it can benefit students socially by connecting them with academic peers on their academic level. Compacting Instead of testing out of an entire grade level, students are pre-examined for proficiency and knowledge in specific areas, and allowed to skip units they have already mastered. This reduces boredom and permits advanced students to use the extra time for independent study or moving on to the next unit. Ability grouping Small groups of high-proficiency learners are clustered in study groups for special lessons. This can involve pull-out programming for enrichment activities, or special class models grouped by ability rather than age. This connects students to role models with similar abilities, and places them in a learning environment that values high performance. Independent Study Options for independent study include mentorships, online distance learning or correspondence courses, and selected in-depth readings or research topics. This can also be carried out within a classroom setting, and paired effectively with compacting or credit by examination. This approach permits proficient students to advance at their own pace. Introduction to Gifted Education: Provides an overview of the field, including social and philosophical foundations, definitions, history, identification methods, curriculum analysis, and assessment of characteristics and needs of gifted learners. Also covers theories of intelligence, and social justice issues as they relate to gifted and talented education. The course provides a career foundation for tutors and educational support personnel. Classroom Assessment: Students focus on developing skills to measure dimensions of giftedness, including creativity, intelligence, and achievement. Topics include methods and instruments of assessment, procedures for making placement decisions, statistical interpretation of test results, social and ethical issues in testing, cultural and ethnic diversity, and monitoring the progress of advanced learners. Implications of effective assessment for professional development are also covered, preparing students for careers as curriculum specialists. Collaborative Inclusion Strategies: Students learn strategies, concepts, and methods for effective consultation, communication, and collaboration in gifted and talented educational settings. Students develop respect for the needs of advanced learners through emphasis on understanding the role of cultural, linguistic, and ethnic diversity in identifying gifted youth. Suitable for students interested in classroom teaching roles. HOW LONG DOES IT TAKE TO GET AN ONLINE MASTER'S IN GIFTED AND TALENTED EDUCATION? Most online master's in gifted and talented education programs require an average of 30 to 36 credits, and can be completed in 18 to 24 months. A sample program consists of 15 core credits and 15 credits in the gifted specialty (including a capstone). Courses are usually about seven weeks long, and students typically take two courses per 14-week semester. In addition to the master's degree, some programs offer a specialty endorsement in gifted and talented education online that can be completed in one year. In traditional master's programs, students progress through courses individually, and change courses each semester. In the cohort model offered by many programs, students are engaged in a closely knit learning community throughout their studies and graduate together. The cohort model offers automatic non-competitive enrollment in classes, helps build strong bonds with fellow students, and offers support for completing program requirements in a timely fashion. Professional teaching license: All teachers who work in public schools must be state licensed. Requirements for professional licensing vary by state, but typically include a master's degree, a background check, supervised teaching experience, and completion of a teacher preparation program. Some states require a certification exam and a specialty exam in gifted education. Administrator license: Administrator licenses are issued to master's degree holders who have completed an administration preparation program. The licensing process differs from state to state, but typically requires three years of experience as an educator, a licensing exam, and a background check. The license is valid for any career in elementary and secondary administration. Accreditation is a process of peer review to ensure that institutions meet rigorous standards of quality. It provides a seal of approval to help students avoid "diploma mills" or other dubious institutions. Agencies recognized by the U.S. Department of Education (DOE) and the Council for Higher Education Accreditation (CHEA) handle regional accreditation. Schools with regional accreditation have met standards for their state. National accreditation is awarded to vocational, technical, and distance education institutions that have met standards of CHEA-approved agencies. These schools are often for-profit, or have religious affiliations, and the accreditation requirements are less standardized than those for regional accreditation. When choosing an online master's program, be sure to verify that it is accredited both regionally and by the Council for the Accreditation of Educator Preparation (CAEP). CAEP is the field-specific professional accrediting agency for educator preparation providers. Its mission is to ensure and advance equity and excellence in educator preparation accreditation. To ensure that the organization accrediting an institution or program is reliable and worthy to provide the official stamp of approval, agencies need to "accredit the accreditors," a function that is handled by the DOE and the CHEA. The DOE, a government agency, facilitates equal access and promotes educational excellence and achievement. The CHEA is an association of degree-awarding schools that recognizes institutional accrediting organizations through its focus on quality assurance. The DOE and CHEA databases contain only recognized accreditors. You can find a list of all accredited schools on the DOE and CHEA websites. Graduates who hold master's degrees in gifted and talented education may work within a wide variety of service settings. For example, many work in public or private elementary, junior high, or high school classrooms as teachers, program facilitators, or curriculum specialists. Others work in educational consulting agencies, contribute to textbooks, or specialize in professional development for gifted education. Educators with extensive leadership and classroom experience often move into administrative positions. To properly serve the needs of gifted students, professionals in the field must be critically reflective and able to make student-centered decisions. Below are examples of five career opportunities for educators with a master's degree. Instructional coordinator: Instructional coordinators supervise school curriculum development and instructional standards with the goal of quality improvement. They often work in district headquarters alongside teachers and administrators to develop educational material and implement teaching strategies. A master's degree, a teaching or administrator license, and related experience are requirements for this professional role. Special education teacher: In a gifted and talented educational setting, special education teachers adapt lessons to suit the needs of advanced learners, teaching subjects such as reading, writing, and math at advanced levels. They must be state licensed to teach in public schools, and may work in pullout settings or in special schools for the gifted. High school teacher: High school teachers instruct students in 9th through 12th grades, helping them properly prepare for entry to colleges and jobs. With state licensure and a master's specializing in gifted and talented education, teachers may begin their work with advanced placement students, and may eventually move into administrative or program facilitation roles. Middle school teacher: Middle school teachers students typically from the 6th through 8th grades, to help them properly prepare for the challenges of high school. All public school teachers are required to earn state licensure, and a master's in gifted and talented education may improve hiring prospects and open career paths into administration. Elementary school teacher: Elementary school teachers instruct younger students, typically in kindergarten through 5th grades, in basic subjects such as math and reading to prepare them for future education. Teachers in public schools must hold a state-issued license, and those who earn a master's may move into positions in curriculum design or educational administration. One of the advantages of a master's degree is an increased chance of being hired for the job you want. According to a recent report from Georgetown University's Center on Education and the Workforce, job placement rates favor graduates with master's degrees in education. This is particularly true in special needs education, where master's degree holders are 2.5% more likely to be employed than college graduates with some work experience. The table below features data from the Georgetown report comparing unemployment rates for master's degree holders with those of experienced bachelor's degree holders for three concentrations in education. Students and graduates of online degree in gifted and talented education programs can take advantage of professional development and networking opportunities by joining membership organizations. Widely available members-only benefits include scholarships, continuing education webinars, and extensive career services such as job boards, coaching, resume writing, and reference checking. Conferences are usually held annually, and feature expert speakers. Some professional associations can connect students with mentors, or even offer access to legislative meetings for educational policy recommendations. National Association for Gifted Children: NAGC supports those who enhance the growth and development of gifted and talented children. The organization offers an expert speakers program, a career center, access to webinars on demand, scholarships and awards, and an annual convention featuring over 300 sessions. The Association for the Gifted: TAG, a division of the Council for Exceptional Children, helps parents and professionals work more effectively with gifted and talented youth. The association publishes a journal, offers discounted student memberships and insurance, and provides members with access to a career center and continuing education programs. World Council for Gifted and Talented Children: WCGTC is a worldwide organization providing support and advocacy for gifted and talented children to ensure that they reach their potential. The organization offers a biennial world conference, awards and scholarships, a newsletter, job postings, a student research database, and members-only networking. The first step toward qualifying for all federal financial aid is to complete the FAFSA form offered by the U.S. Department of Education. Grants, fellowships, federal and private loans, scholarships based on need or merit, and institutional financing plans may be available. Students who intend to teach at schools serving low-income students should consider grant programs such as Teacher Education Assistance for College and Higher Education. The U.S. Department of Labor database is an excellent place to begin.